Sergei Viktorovich Fedorov (born December 13, 1969) is a Russian professional ice hockey forward and occasional defenceman. Sergei Fedorov gained fame in the NHL for his unique style of play with the Detroit Red Wings, where he won 3 Stanley Cups. Sergei Fedorov played in over 1,200 NHL contests. On October 25, 2008, Fedorov passed Alexander Mogilny to set a record for most goals by a Russian-born NHL player, scoring his 473rd goal. 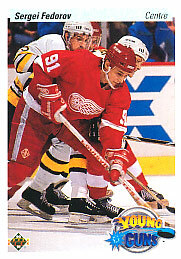 Sergei Fedorov was also the first European-trained player to win the Hart Memorial Trophy in 1993–94 NHL season . Sergei Fedorov was considered one of the best players in the world in the 1990s leading into early 2000s.